If you are looking for a simple frequency divider circuit. This circuit may be suitable for you. It is designed to divide a frequency of input signal into just half. Then, goes out of the output. The advantage of this circuit is a small circuit. It uses just a transistor only and others few components. So cheap and get easily all components. 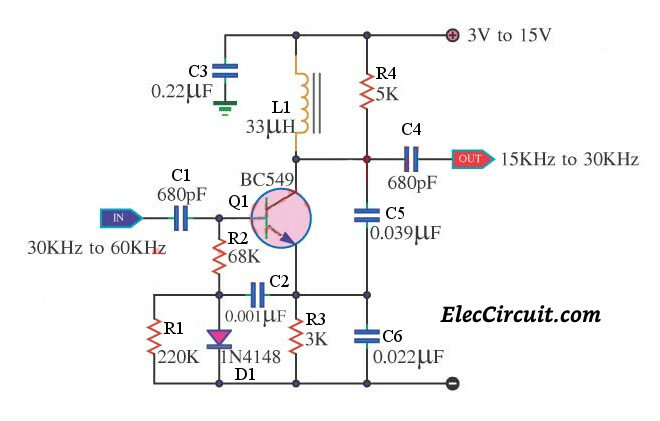 Since the transistor-Q1 (BC549) gets a biased current in non-active status. So, It is active only in the range of input is positive voltage only. This circuit uses a main idea from the common-base Colpitts oscillator model. The Colpitts circuit looks like other LC oscillators. The simple circuit consists of a bipolar transistor with its output connected to the input, in a feedback loop. Which contain with a parallel LC circuit. The parallel LC circuit is called a tank circuit. The tank Circuit consists of L1, C4, and C5. They can set the frequency is about 16.5 kHz. When input single of 30kHz-60kHz comes to the input of the circuit. The circuit will lock, generate the oscillator in range frequency of 15kHz – 30kHz. The other details, please see in the circuit. Good luck! I just rewrite this post to easy to read. I hope my English improve.